Greece captain Giorgos Karagounis has retired from international football following his country's elimination from the 2014 Fifa World Cup. The 37-year-old midfielder announced his decision after playing the whole match as Greece lost on penalties in the last-16 tie against Costa Rica. 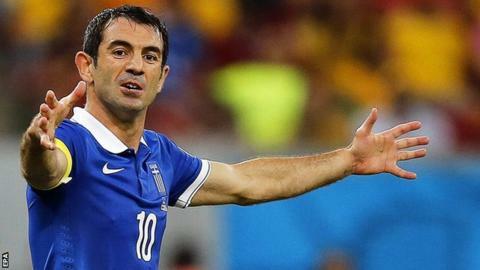 "This was my last game for Greece," said Karagounis. "We wanted to stay in Brazil another week or even longer but you can't change it now." Karagounis made his international debut in 1999 and amassed a record 139 caps for his country, scoring 10 goals in the process. He helped Greece win Euro 2004 and their progress in Brazil meant they reached the second round of the World Cup for the first time in their history. Karagounis, who was released by Fulham at the end of last season, said he was making way for Greece's next generation of players. "The national team has grown up, younger players have won invaluable experiences," he added. "This is no small thing and as we helped the team come of age we hope it will continue to be as successful in the future." Greece coach Fernando Santos will also leave his post after his contract expired on Monday. Santos was sent to the stands before the penalty shootout took place against Costa Rica and had to watch on television as his side made their exit from the World Cup.